234 pages | 198 Color Illus. The market and policy impetus to install increasingly utility-scale solar systems, or solar farms (sometimes known as solar parks or ranches), has seen products and applications develop ahead of the collective industry knowledge and experience. Recently however, the market has matured and investment opportunites for utility-scale solar farms or parks as part of renewable energy policies have made the sector more attractive. This book brings together the latest technical, practical and financial information available to provide an essential guide to solar farms, from design and planning to installation and maintenance. The book builds on the challenges and lessons learned from existing solar farms, that have been developed across the world, including in Europe, the USA, Australia, China and India. Topics covered include system design, system layout, international installation standards, operation and maintenance, grid penetration, planning applications, and skills required for installation, operation and maintenance. 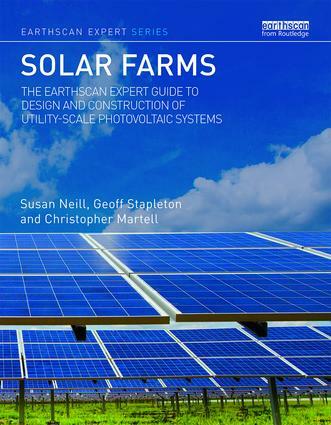 Highly illustrated in full colour, the book provides an essential practical guide for all industry professionals involved in or contemplating utility-scale, grid-connected solar systems. Susan Neill is Director of Training and Engineering at Global Sustainable Energy Solutions (GSES), Australia. Geoff Stapleton is Managing Director of GSES and a part-time lecturer at the School of Photovoltaic and Renewable Energy Engineering, University of New South Wales, Australia. Christopher Martell is Director of Operations and Engineering at GSES, Australia.